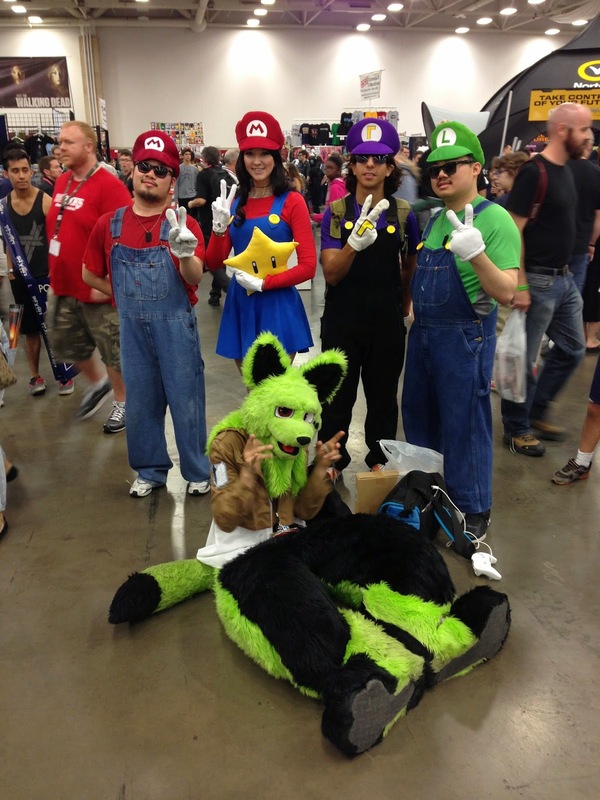 My favorite convention of the year is the Dallas Comic Con. It's one of the largest in Texas, and I always look forward to seeing my friends here. The convention was held at a larger venue for the first time, too. This had its pros and cons. It was nice not having to wait in line outside in the heat. It also meant the lines inside were managed better since it was mostly all on one floor. At the old convention center, people were getting stuck on the *single* escalator and missing panels because they couldn't get upstairs! The larger venue brought a larger ticket price, though. I ultimately decided to go for the VIP ticket and not go to San Diego Comic Con. One thing I loved about VIP was the lounge. We had a separate seating area with large tables for eating and free water. This was great for me and my parents to take a break in. I was disappointed that VIP didn't include a free t-shirt (like the badge said we'd get), and that we weren't allowed into the Star Trek panel. That panel cost an additional $20, and I felt like it should have been included in the VIP ticket price. 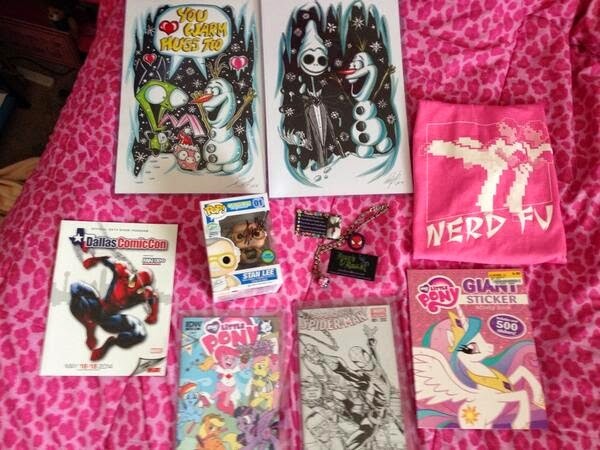 I bought several goodies including a necklace from Faye's Realm, two Olaf prints from artist David Wong, and a MLP sticker book. I also managed to get a free Josie and The Pussycats and Spider-Man 2 poster from the freebie room. Another great item I received was a pink Nerd Fu t-shirt! The media guest list didn't include many new folks that I hadn't seen before. However, I was still excited to meet Nathan Fillion. He canceled last year the DAY OF the convention. When I was next to get his autograph at his table, he looked at my Thor costume and said he loved it and had to get a pic of it! I couldn't believe what was happening.. So I imagine I made a silly face for the photo! 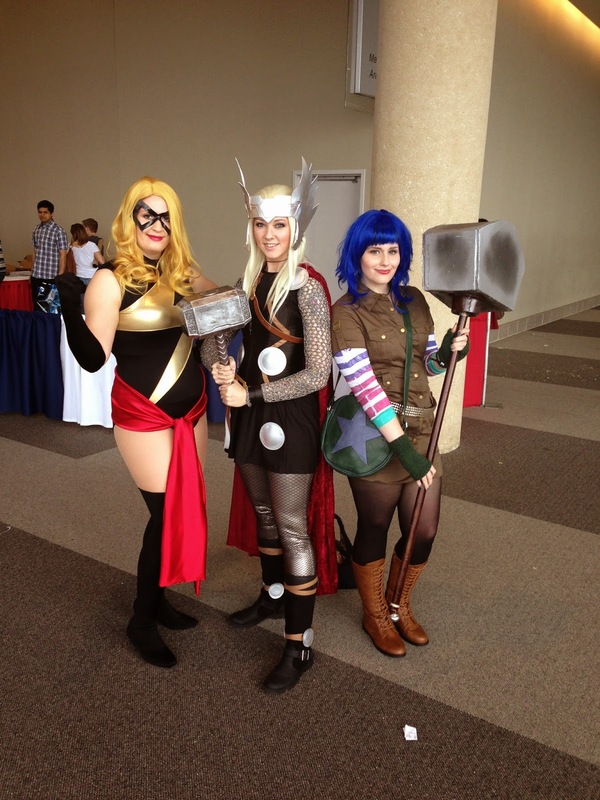 But that means there's a picture of ME dressed up as Thor on Nathan Fillion's phone. LOL! 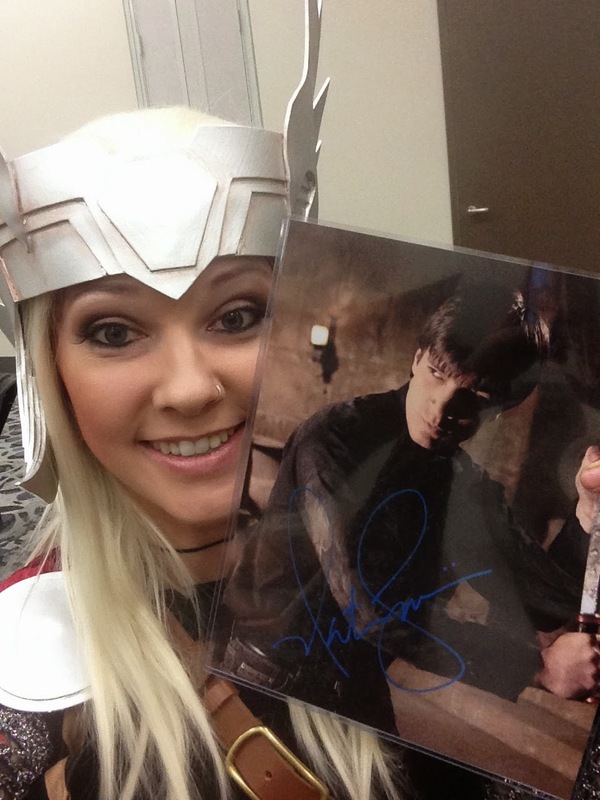 I had him sign this picture of him as Caleb from Buffy the Vampire Slayer and was beaming with excitement afterwards! The only other autograph I got was from Stan Lee. I've actually already seen him two other times, but never waited in his long line to get his signature. Since we had VIP, we were able to get in early and be first in line! No cameras were allowed at the table, but after he signed my Stan Lee Funko Pop he looked up at me and I thanked him for this opportunity to meet him! It was all kinds of rushed so all he said back to me was "Thank you" as well, but we made eye contact and he smiled. So that was a really special moment to meet such an incredible man! Stan Lee's panel was funny, informative, and such an amazing experience. He always gives insight into his comics, and I leave having learned and laughed so much. The only other panel I was able to watch was the Firefly reunion on Sunday. It started out with a bang - Joss Whedon himself filmed an intro just for Dallas Comic Con attendees saying he wish he could be there. Then things kinda went south when the cast came out and the giant curtains began to fall. Thankfully no one was hurt! Another favorite moment for me was seeing the Impala from the TV show Supernatural. As soon as I spotted this car I gasped and ran up to it! I am a big fan of Supernatural and had no idea that Dean's car would be here. It was cool because they decked out the inside and trunk with accessories and weapons like you'd see on the show! More pictures of it are in my Facebook album. My cosplays turned out great with no major problems at all. I received many compliments and met a lot of new friends. The venue was so large, though, that I managed to miss seeing a lot of my cosplay buddies. I think next time I will have to set up a meeting spot so I can make sure to see everyone. Overall, I think the Dallas Comic Con this year went well! I think they'll make a few changes for the next one, but really it was quite successful. I do hope they get more of a variety in guests. I even suggested they start inviting book authors! Book fandoms would draw a large crowd, and you bet I would wait in line to get my favorite book series signed. 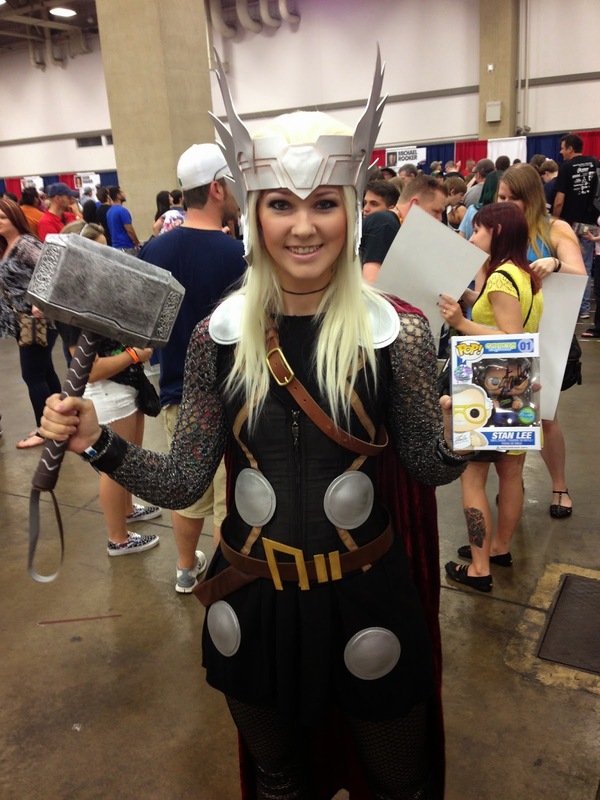 Also, be sure to check out my Facebook album for all the photos from Dallas Comic Con! My next convention was last weekend at A-Kon 25 in Dallas. So I will have a post on that soon. love it!! so awesome that a photo of you is in Fillion's phone!!!!! So rad that you finally got to meet Nathan, I can't believe that he took your photo as well. So cool. Your cosplay was amazing as always. 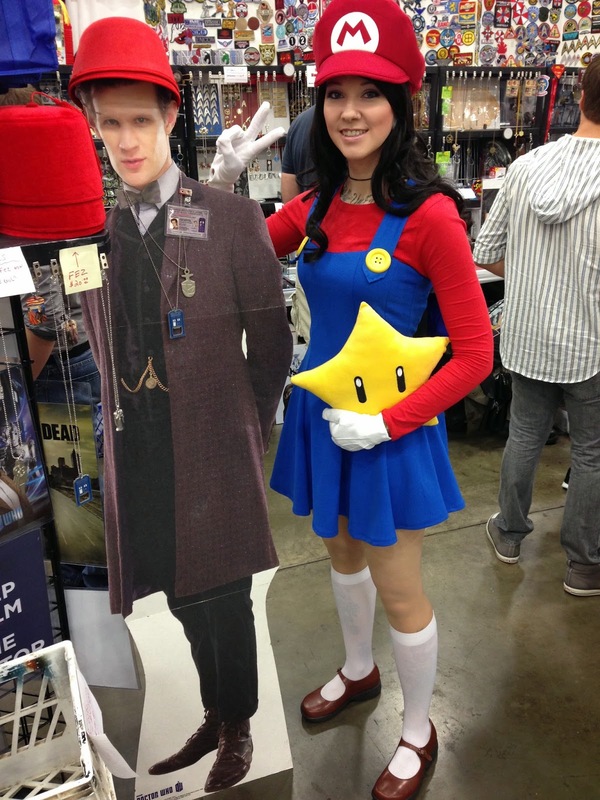 I loved the Thor and you looked so adorable as Mario. Yes I will come back to this lace, its huge and open, and have really tall ceilings. Wait staff was also pretty good. Bartender was awesome and personable.